CRC BRAKLEEN, the number one selling brand and original aerosol brake parts cleaner, is available in both chlorinated and non-chlorinated formulas, to comply with state regulations and meet the needs of professional shops and DIY consumers in all 50 states. Managing individual state regulations for maintenance chemicals can be complex for distributors, wholesalers, retailers and end-user consumers. CRC continually monitors regulatory trends and the potential impact, aiming to simplify decision making for its customers and ensure their compliance. As a result, CRC has also revamped the BRAKLEEN line’s packaging to make it easier to identify which formulas to choose. Depending on the state, brake cleaning products may be restricted from including chlorinated solvents in their formulas. CRC supplies unique BRAKLEEN formulations to meet the needs of the marketplace as well as individual state regulations for chlorinated solvents and volatile organic compounds (VOCs). Now, each CRC BRAKLEEN package clearly reflects the specific formula. The original, chlorinated formula is sold in red label packaging, and all non-chlorinated formulas are sold in green label packaging. While the original, best-selling CRC BRAKLEEN formula may be used in all states excluding California and New Jersey, some facilities restrict the use of chlorinated solvents. Non-chlorinated brake cleaners contain VOCs to replace some of the cleaning power lost when switching to non-chlorinated formulas. However, individual states have set varying limits on the use of VOCs. Consequently, CRC offers BRAKLEEN in eight formulas including regular and PRO SERIES versions of Non-Chlorinated – High VOC, Non-Chlorinated – Low VOC, Non-Chlorinated – Less than 10 percent VOC and Non-Chlorinated – Ultra Low VOC formulas. 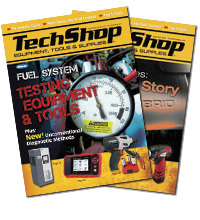 This wide array of choices allows consumers and professionals to access the strongest possible brake parts cleaner while remaining compliant with local regulations. Retailers and distributors who carry both the chlorinated and non-chlorinated formulas are assured that they will have the right brake cleaner for the needs of all of their customers. CRC BRAKLEEN has been the market leader since 1971, and CRC continues to innovate the brand. In 2018, CRC introduced the BRAKLEEN PRO SERIES line, packaged in professional-size cans containing more ounces and featuring enhanced formulas to improve cleaning power. The PRO SERIES cans utilize a PowerJet nozzle to help blast grime and grease off of brake parts surfaces. CRC BRAKLEEN formulas are available in a variety of packaging options including aerosol spray cans, jugs, pails and drums. 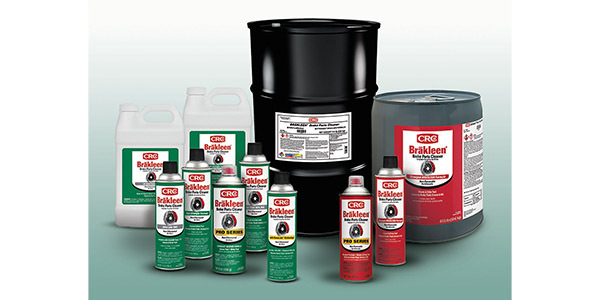 In addition to its CRC BRAKLEEN brake parts cleaners, CRC offers a complete line of brake maintenance products and other highly-specialized formulas for multiple service categories including engine, electrical system, fuel system, cooling system, transmission and power steering.